Our hydroponically-grown basil is on our farm in northeastern Pennsylvania from seed to harvest and is 100% GMO-Free. We use alternative pest control methods and maintain strict standards, so that every shipment is of the highest quality. Our basil is harvested to order by hand, and the plants can get to you within 24 hours or less of being harvested. You'll find our basil in grocery markets all over the northeastern United States all 52 weeks of the year. If you don't see it in our local grocery store, let us know! Sun Aqua Farms is 100% GFSI-level certified (meaning we are held to high standards and undergo third-party inspections) and maintains food safety policies and procedures to ensure that your basil is both great tasting and something you can have confidence feeding to your loved ones. We believe that what sets us apart is our premium quality and attention to detail. We have been growing basil for more than 20 years and have a consistent track record of high quality plants. We grow varieties of basil that are high in the oils to provide the great aroma and flavor our customers are looking for in their basil. Many other farms will grow varieties that look good and are more hardy, but are lacking in aroma and flavor. 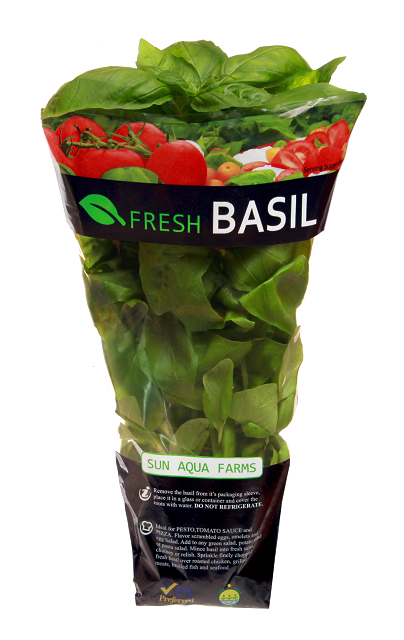 Sun Aqua Farms has been growing basil since 1995 for the grocery market. Starting with just one hand built greenhouse, we now have 28 greenhouses in two sites to serve our customers all year round.